The other features such as automatic bracket completion, the ability to move code lines or blocks using keyboard shortcuts, and in-line navigation are now built-in. In addition, Visual Studio 2013 Preview includes a new Team Explorer with an enhanced Home page that provides easier navigation to team collaboration features, including the ability to undock Pending Changes and Builds into a separate window. Scott Hansleman shows how the Page Inspector feature in Visual Studio 2013 allows you to work interactively with the rendered page markup, fully integrated with the source code that rendered it. In addition to the next round of improvements to our web based test case management solution, today Microsoft introduced a preview of a brand new service – cloud load testing. Since VS 2005, Microsoft supported Load Testing. It allows you to validate performance, scale and reliability of your server apps. However, you have to set up and configure your own infrastructure to run load tests. With our new Team Foundation Service based load test solution, you can now load test your apps without configuring any infrastructure. 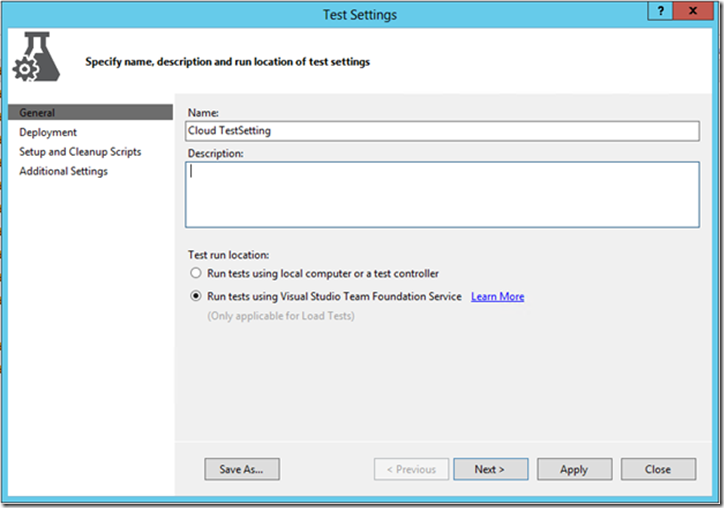 Just use Visual Studio Ultimate Edition to create a load test and point it at Team Foundation Service and soon you have load test results for your application. It is going to be particularly valuable for people building Azure applications who want to verify the scalability of their apps before opening them to a broad user base. Ability to log in and sync settings and themes; similar to Office 2013, you will be able to log in with your Microsoft Account and choose settings to sync between all your devices running Visual Studio 2013. All options menus and toolbars now have a built in search bar for quickly finding settings. The Quick launch bar in the top right corner introduced in VS2012 can also be used to quickly find settings and options. The options menus can now be resized, so you’re not restricted to the default size. Updates to visual studio will now appear as individual updates that you can choose to install or dismiss, rather than forcing you to install all or nothing. If you dismiss an update it will not remind you again. Informational updates will appear as white, while warning updates will be yellow, and critical updates will be red. 200+ bugs with high DPI monitors have been fixed with VS2013, including how options are displayed. New enhanced scrollbar allows you to see a small preview of your code file, allowing you to easily locate break points and changes. The ability to auto-complete braces, comments, and quotes has now also been included out of the box, meaning you can open a curly brace and start writing without worrying about the ending brace. Instead of pressing F12 to navigate to a method, and losing your place in your previous file, you can now use Preview Peek, by pressing Alt + F12 instead of just F12, which allows you to view the method or class inline of the same document. From within that document you can then navigate into further documents, all within the same Preview Peek instance, using breadcrumbs to navigate backwards again. You can also simply press Esc to close the Preview Peek taking you back to the original document. At this time we cannot edit code within the Preview Peek pane, however this may be included in the full release. Solutions will now be loaded async, meaning you can open solutions with 100+ projects, and they will open in the background allowing you to work on files while everything else loads. The files you last had open will load first allowing you to quickly resume where you left off. Code Lens above each method allows you to show what references this method, and also who wrote the method, and who tested it. You can also see the unit tests the use the method, and easily run them. Building projects or solutions will now also be performed async, so you can start a build and continue working while it processes in the background. You also now have the ability to cancel a build if you choose. 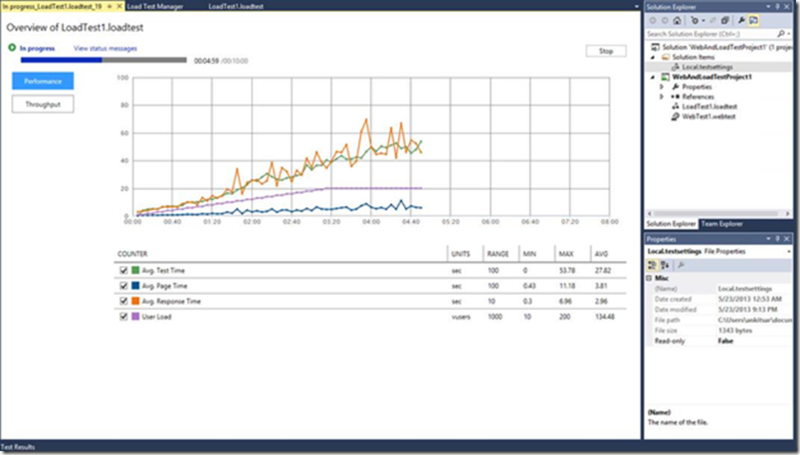 The Windows Azure SDK 2.2 has been released to support the final RTM release of Visual Studio 2013. In this episode, Robert is joined by Paul Yuknewicz, Dennis Angeline and Boris Scholl for a look at how the SDK adds new levels of productivity to Visual Studio for cloud development. C++ developers in Visual Studio 2013. Microsoft’s Tarek Madkour held a presentation titled, “Visual Studio 2013 for C++ Developers”, which looked at the forthcoming features of particular interest to C++ developers. Makour began his talk with the reasons Microsoft feels developers use C++: performance, compatibility (ability to use older C++ code today), and portability. To those three Madkour added Windows 8.1 tools and productivity as areas that he address in regards to VS2013. VS2013 – Async Debugging. Previously, it could be very difficult for a developer stopped at a breakpoint to know the asynchronous sequence of calls that brought them to the current location. Now in Visual Studio 2013, the Call Stack window surfaces this information, factoring in new diagnostics information provided by the runtime. Further, when an application stops making visible forward progress, it’s often difficult to diagnose and to understand what asynchronous operations are currently in flight such that their lack of completion might be causing the app to hang. In Visual Studio 2013, the Tasks window (formerly called Parallel Tasks in Visual Studio 2010 and Visual Studio 2012) now includes details on these async operations so that you can break into your app in the debugger and easily see and navigate to everything that’s in flight. Previously, it could be very difficult for a developer stopped at a breakpoint to know the asynchronous sequence of calls that brought them to the current location. Now in Visual Studio 2013, the Call Stack window surfaces this information, factoring in new diagnostics information provided by the runtime. Further, when an application stops making visible forward progress, it's often difficult to diagnose and to understand what asynchronous operations are currently in flight such that their lack of completion might be causing the app to hang. In Visual Studio 2013, the Tasks window (formerly called Parallel Tasks in Visual Studio 2010 and Visual Studio 2012) now includes details on these async operations so that you can break into your app in the debugger and easily see and navigate to everything that's in flight. Visual Studio 2013 Preview is here with lots of exciting new features across Windows Store, Desktop and Web development. 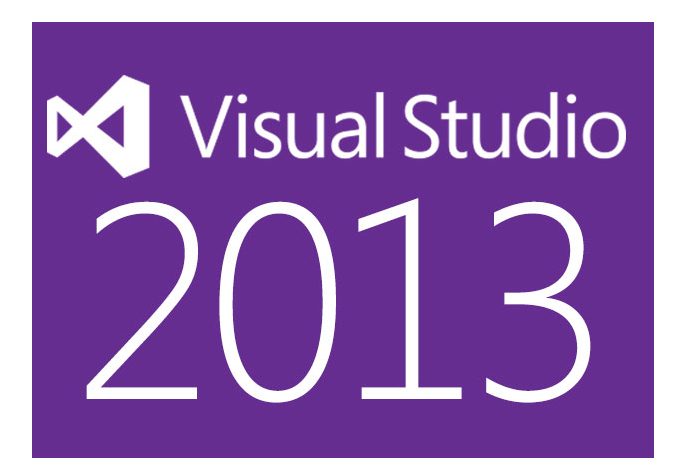 Visual Studio 2013 for Web Developers. New cool features for building web sites by Mads Kristensen - senior program manager from Microsoft, no overlap with Hanselman podcast. He is presenting new html editor, web essentials, browser link etc. With Visual Studio 2013 it just gets better when your IDE is connected. Cathy Sullivan - program manager from Microsoft in IDE expirience team describing new editor productivity, themes and visual design and many more cool stuff. 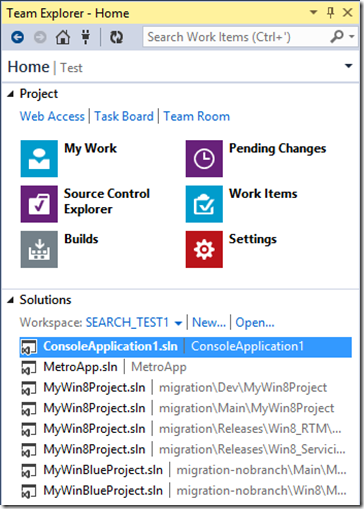 Visual Studio Team Blog: Visual Studio 2013 Preview Available Now! Visual C++ Team Blog: Visual Studio 2013 Preview Now Available! Visual studio 2013 release date is unclear, but we can see that new Visual Studio 2013 application lifecycle management capabilities, new Windows Store app templates, to Python support in Visual Studio, to F# support for portable libraries, to enhancements to ASP.NET (such as the new “One ASP.NET” unified experience), to the latest Office Developer Tools, to significant performance improvements across the IDE there is a lot more to explore. As you can see there’s a ton of stuff and I had to carefully filter everything to keep this post from getting even longer.